A half marathon is 13.1 miles or 21km for those of your who are metrically minded. At 43 years old you can’t really just rock up at the start line and expect to survive that length of run. So you train. You run 4 times a week for months. You start off at where you are and you do more and more miles. For me the start was a slow 5k. You add some distance to one run each week and this becomes your long, slow run. Next comes a short recovery run which is more of a really slow jog to get your muscles working after the long, slow run. The other two runs are where the speed comes. A quick 5k, a tempo run for 8k or maybe a run that you up the pace a couple of times. Pretty soon the miles are starting to rack up. I’ve spent 8 hours running this month and have covered nearly 80km (50 miles). There are still two weeks of the month left! Well, because when you sponsor someone to run a 13.1 mile race you’re actually sponsoring them to actually run close to 200 miles. Every mile adds up and every mile counts. Just like the sponsorship you’ve been so generous to donate. So far I’ve raised £460. That’s amazing. A massive thanks to all of you for your support and generosity. It’s always exciting when my phone makes the ‘Just Giving’ ping noise meaning that someone else has just donated. You have been so generous. So, what will Macmillan do with your money? £1,020 could pay for a Macmillan nurse for a week, helping people living with cancer and their families receive essential medical, practical and emotional support. £537 could pay for a Macmillan social worker or family support worker for a week. They work with community and social services agencies to help people manage the social and practical problems of living with cancer. £390 could cover the costs for a person to attend a small physical activity scheme in a rural area for a year. Between £200,000 and £600,000 could pay for a new chemotherapy suite in a local hospital. Between £3 million and £7 million could pay for a new oncology and outpatient unit in a hospital. You can help by visiting my Stewart’s Just Giving page or by texting STEW68 £5 (or any amount) to 70070. So, thank you. Thank you so much for your support. It means the world to me to be able to help a charity that gave so much help and support to my mum and to my dad. So, it’s been a while since I’ve blogged about running, and in particular my half marathon run with my brother-in-law, Scott, in October. To be honest, our training hasn’t been going well, between writing essays, work and Scott moving house it’s all a bit frantic. But we’re committed and tomorrow I will run. Promise. Why is this so important to us? Well, in just 14 weeks we’re running the Great Scottish Run in Glasgow in memory of my mum, Annis, and we would dearly like you to help us raise £2,000 to help a brilliant organisation who helped her over the last 16 years of her life, macmillan cancer care. We know that £2,000 is a lot of money and that you are all skint, but it’s been a cracking day and I’m sure you’re sitting somewhere nice with a nice cold beer or a tasty ice cream. How about, instead of having another one, you donate £3 to macmillan instead? You donate £3 and tomorrow I’ll run 3 miles. Deal? Just text STEW68 £3 to 70070 or visit our justgiving site and donate there. We and the thousands of people who are living with cancer and it’s effects would really appreciate it. On Sunday I followed in the footsteps of Olympic heroes in the National Lottery Anniversary Run. The National Lottery, one of the biggest funders of the 2012 Olympics, thought otherwise. Legacy was always one of the questions hanging over the Olympics. How would the Games translate into wider participation? Well, 10,000 people signed up, paid up, and ran the anniversary run with 5,000 people, children and their families, taking part in the 2.5k family run. This year David was also able to get a place so we set off on Saturday morning for a weekend in London with our better halves. The 7am flight from Glasgow to Luton is always a shock to the system. It means a 4am start. It also means that being shattered for the rest of the day! We spent most of Saturday morning drinking coffee and trying to wake up and shopping at Westfield, then it was off to check in to our hotel out at Docklands, a nap and then off to the West End for dinner and The Phantom of the Opera. I’ve seen the show on TV and we watched the movie the other night but there is always something magical about live theatre. Phantom didn’t disappoint. Sunday morning started at 7am with a light breakfast then we took the DLR to Stratford, along with thousands of other runners and their supporters. There was a a real sense of excitement as we wound our way through the shopping centre at Westfield and out towards the Olympic Park. The last time I was here the park was a building site. All the major venues had been completed but the landscaping and temporary seating was still being installed. Just over a year later and the Olympic Park is in a similar state. The temporary venues have been removed and their sites are being redeveloped. The extension wings have been taken off the aquatics centre (photo above) making it look very different. The new glass walls are almost complete and the building looks great. The warm up, courtesy of Mr Motivator himself, Roy Gale preceded start by Britain’s greatest ever Olympian, track cycling king, Sir Chris Hoy. The race route was different this year. It even had a bit of cross country at the start! It was also pretty tight and twisty so it was difficult to run at race pace at the start of the race. And it was hot and humid. Thankfully it was cloudy which kept the temperature down a bit. 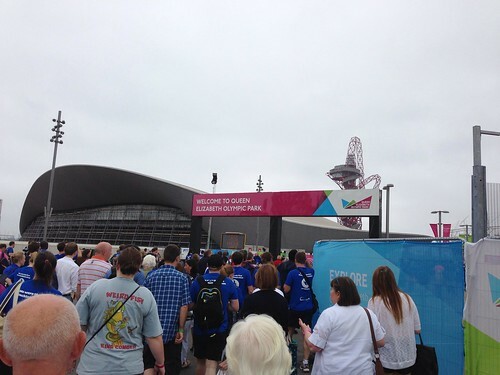 It was a great run and you could feel the sense of excitement building as we wound our way towards the Olympic Stadium. 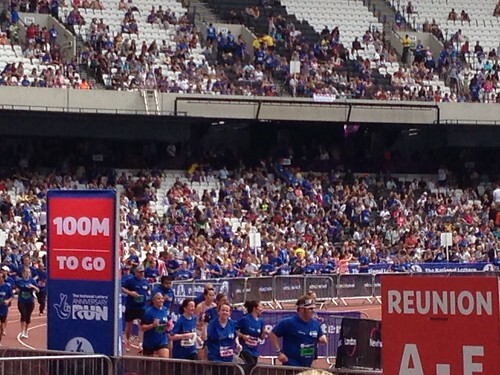 At around 21 minutes a roar erupted from the crowd as the first runner entered the stadium. The noise was amazing, especially as the stadium was less than half full. It gave us a real sense of what it must have sounded like as Mo Farah was cheered round every lap of the 5,000m and 10,000m on that Super Saturday. I was only just past half way! I was looking forward to the tunnel more than the stadium. As I entered the tunnel under the stadium I could hear the crowd… but not the crowd from today. It was the crowd from Mo’s gold medal run, along with commentary from Steve Cram and Chariots of Fire in the background. I could feel a wave of emotion sweep over me as I pushed my pace knowing I was close to 40 minutes. There’s light at the end of the tunnel… brilliant sunlight. The thing I noticed about the track is the bounce. Maybe it’s because you come straight off the concrete of the tunnel but the track is fantastic to run on. And all of a sudden you find yourself on the home straight and crossing the line, gasping and smiling and knowing that you have followed in the footsteps of legends. Once we found Pam and Avril in the crowd we sat in the sun, ate our way through the nuts, biscuits and crisps in the goody bag, and watched the rest of the runners come in. It’s fair to say that the runners came in all shapes and sizes. I stood to applaud a woman with crutches cross the line but also for a woman who must have been at least 20 stones struggle down the last 100 meters. At some point she must have thought “I can do this. I can run 5 miles.” And she did. She made it, along with all those others who must have wondered what on earth made them sign up, wondered if they could do it on such a hot and humid day and, as they crossed the line, knew that I can do this I can do whatever I put my mind to. That’s the real Olympic Legacy. For us the rest of the day involved a picnic from M&S, a shower and a change of clothes and off into London for a wander around Harrods, a fantastic (and very expensive) cake from the Gand Cafe, sunbathing in Hyde Park and dinner at Jamie Oliver’s Union Jacks at Covent Garden. Monday was the hottest day in years. 33C. We headed back to the air conditioning of Westfield in the morning for some breakfast and shopping then to Trafalgar Square for a sandwich and then the National Gallery and a wander round Whitehall. By late afternoon we were just hot and tired so diner was Yo! sushi at St Pancras and then off to Luton for the flight home. It’s taken a while, but I’ve finally logged 2,000km running with Nike+. I ran the Glasgow Half Marathon in 2000 and then didn’t run another step until 22nd Feb 2010. I can’t really remember why I thought it was a good idea to go for a run and I soon decided that it wasn’t really. I lasted 3 months and didn’t run at all through June, July and August 2010 and didn’t run again more than a few km once or twice a month until March 2011. That first run should give everyone hope! 3km with an average pace just over walking speed. 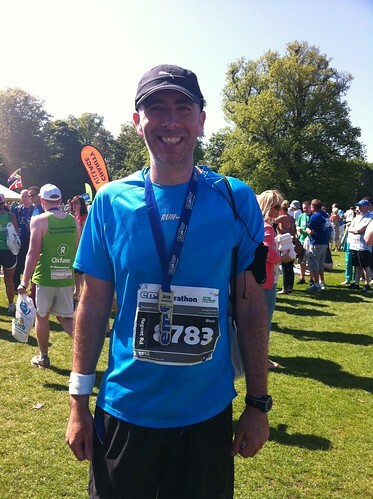 On 27th May 2012, age 40, I ran the edinburgh marathon on one of the hottest days of the year. It was 26C at times and I loved every step of the 26.2 miles! I’ve just re-read my post about my marathon and still feel quite emotional about it. There’s something about marathons that bring out the very best in people. On 31 March 2012 I was part of the first run ever in the Olympic Stadium in London, the National Lottery Olympic Park Run. You can read all about that experience in ‘Making History‘. I’ll never forget running around the tunnel under the stadium with Chariots of Fire playing on the PA and then emerging into the Olympic Stadium. The good thing about running is that the journey is never really over, and you never know what’s around the corner. Strathclyde parkrun, a weekly free timed 5k, is one of the highlights of my week. Who ever thought that dragging yourself out of bed to run at 9:30 on a Saturday would be a thing I looked forward to, and missed when I can’t make it, but it really is. 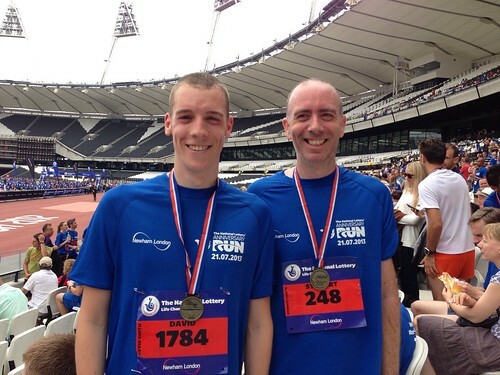 In July I’m returning to the Olympic Stadium for the National Lottery Anniversary Run, this time with David running too. So, here’s to the next 1,000km. I wonder where it will take me? I will run the 5 mile Olympic Park Run in March in under 40 minutes. I will run my first marathon in Edinburgh in May in under 4 hours 10 minutes. I will run the Great Scottish Run half marathon in Glasgow in September in under 2 hours. I will beat my 5km parkrun PB (23:50) by more than a minute. I will run more kilometers than in 2011 (915km). I will run at least 1200km in 2012. So… how did I do? I will run the 5 mile Olympic Park Run in March in under 40 minutes. – 42 mins. I will run my first marathon in Edinburgh in May in under 4 hours 10 minutes. – 4.49 on the hottest day of the year! I will run the Great Scottish Run half marathon in Glasgow in September in under 2 hours. 2.10, again! I’ve spent big chunks of 2012 being unable to run. I have a recuring muscle injury and it has claimed about 3 months of running. I managed 780km, which is less than 2011, even though I ran a marathon. Still, the Olympic Park Run and my first marathon are things I’ll never forget! I’ve been off on my travels again, this time to Northampton for a couple of meetings. It’s always been part of my job to be away from home but I’m often struck my the paradox of working for an organisation that promotes good relationships but is happy to ask it’s members and staff to spend lots of time away from home, especially over things like Father’s Day. It also struck me as I was walking to the car to drive home that I hadn’t been outside for 3 days. That can’t be healthy! The meetings were ok. It was good to see my colleagues and to finally meet Stuart Radcliffe who I’ve been friends with on Twitter for a while in real life. After sitting down for 4 days and driving 700 miles, today I finally got back out on the road for a run. The ongoing saga of ‘will my big toenails fall off or not?’ continues but they don’t hurt so I decided that three weeks was long enough to rest after my marathon. It was great to be outside in the sun and I can honestly say I’ve missed running. The legs are ok, the breathing was a bit harder than before, but that will sort itself out over a couple of runs. My next goal is to get faster. I want to get my 5k time down and then get well under 2 hours in the Great Scottish Run half marathon in Glasgow on 2 September. That’s not long so July and August will be full of hills, intervals and parkruns with a long run every week to keep the miles up. And whisper it… I might run another marathon… but not this year! The weather had been hot and sunny all week but there was a glimmer of hope… much of the Edinburgh marathon is run along the East coast, a part of the world famous for harr (mist from the sea), and the forecast was cloudy for Sunday morning. The sun came out and the temperature shot up. This wasn’t going to be a day for heroics. No time goal, just survive. I got up at 7am, ate some cornflakes and started drinking Powerade. We set off for Edinburgh and met up with David & Pam at our friend’s Sue & Mark in Saughtonhall, edinburgh. A quick toilet stop and a chat with Sue’s brother David who was also running then we hoped on a bus to the start. I had just been telling David that his marathon nightmare was good luck when we discovered the sun screen was missing! Disaster. I was starting to wonder if my lack of marathon dreams was turning into a real marathon nightmare. There was nothing to be done. I set off for the Regent Road start and David walked down to the London Road start. I saw a man with an Isaiah Trust vest on applying sun screen and decided just to brass-neck it and ask. He was a lovely man and we chatted for a few minutes while I helped myself to some factor 50. An American couple asked me to take their photo. They were from Portland, Oregon, so the sun was just as disconcerting for them! More chat with some other runners in the massive queue and then a quick dash to the start and a row from marshalling JammyMo from Strathclyde Parkrun for skipping into the pen a bit further down than I should then a good luck when she saw it was me, and then we were off. The downhill start was great and Avril and Pam were waiting at the point the two starts met with some encouragement. The shade from the tenements as we ran down through Leith was very welcome then we wound through Holyrood Park and down to Meadowbank and Leith Links. The rest of the run is an ‘out and back’ along the sea through Portobello, Musselburgh and Seaton Sands. It’s a brilliant route along the Firth of Forth but the heat was unrelenting, even with a light sea breeze. As we passed through Musselburgh the crowds were brilliant. Loads of people cheering and handing out sweets and drinks. I went through half way in 2:17, about what I’d expected. I was pretty pleased as I headed out onto the long road along the coast to the turn, especially as I saw David heading the other way, well on track for a brilliant time. Miles 15-18 were brutal. The run to the turn at 18 miles seemed never-ending. The cheers from people at Longniddry kept me going and around mile 16 I started chatting to a fellow runner called Liam. 26.2 miles is a long way to run on your own so it was great to have someone to share the rest of the journey with. We started a bit of a run/walk strategy and kept the momentum going. My two marathon running pals had both said ‘Don’t stop. Whatever you do keep moving.’ I was feeling that even the few short walks we had around drink stations were hard to get going from, but really necessary. I saw my friend Alison heading for the turn as we headed back and shouted some encouragement. The last few miles were ok. Liam’s pals joined us from the crowd for a few hundred meters and provided some comedy chat and encouragement and we ran the last 3 miles at a pretty decent pace. As we entered Musselburgh the crowds swelled and it was amazing running the last half mile with everyone cheering. We shared a word of encouragement and picked up the pace for the final straight. We crossed the line as the timer clicked over to 5 hours but our start had been 10 minutes after the London Road start so we had made it in under 5 hours. A text confirmed that finished in 4:49:38. A smiling volunteer presented us with our medals and t-shirts and I thanked Liam for his company as we headed off to find our friends and families. I made the mistake of sitting down and started feeling pretty shaky. Some electrolyte drink and a battle with the mobile phone network later and I met up with Avril, Pam and David who had made it round in 3:34, an amazing time in the heat! I opened a protein milkshake and promptly threw up. To be honest I felt much better and was able to eat the porridge bar in the race bag and take on some water. It was a bit of a trek to the buses but it allowed us to walk back along the race route and encourage the runners home. We saw a soldier I’d been chatting to around mile 10 coming in to the finish. He had carried his full 40kg pack all the way round. What an unbelievable feat. As we headed up the hill we also saw a guy running in a massive bear costume heading for the finish. He must have been melting! Marathons are an amazing experience. The camaraderie amongst the runners is amazing. There is a real sense of people sharing a journey and looking out for each other. People are amazing. They can do amazing things when they decide to. The damage? Stiff legs and blisters under both big toe nails. I might lose the nail on my left foot but I’m sure there are lots of people who will be in a much worse state than me today. I really enjoyed the run. I’ve spent the last two weeks being scared of it and, while it was really hard, it was also stragely enjoyable and I’m proud to join the 0.1% club. My sister Jillian and brother-in-law Scott for looking after the boys this weekend to allow me to run and for feeding me after the run. Anthony for the training runs and advice and all the Strathclyde parkrunners for the encouragement. David for joining the journey and sharing the stat chat. You’re an inspiration. 3:34 in on any day is awesome but in that heat is stunning! Most of all I want to thank Avril. She’s put up with a lot as I disappear for another run, piles of smelly running gear and moaned about my various aches, pains and injuries. I really couldn’t have done it without her support.